Myanmar is eager to share its charming reminders of colonial days and thousands of lovingly preserved pagodas with an appreciative world. Traveling by road, by air and on water; we discover why the country is often dubbed the Golden Land. Cruise journey on Myanmar’s Ayeyarwaddy River is one of life’s great travel experiences. 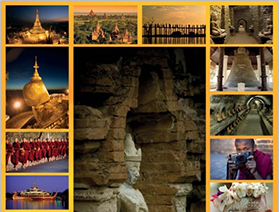 Today you will have a unique opportunity to see the ancient city of Bagan from a different perspective. From a hot air balloon, you will get a magnificent aerial view of thousand-year old pagodas and temples and rural villages nestled along the Irrawaddy River as you glide aloft for about an hour. A champagne celebration concludes our adventure. Return to the hotel for breakfast. After breakfast this morning continue sightseeing in Bagan and then transfer to Gaewin Jetty to embark on a charming cruising boutique hotel, the elegant Paukan, 2007 ship with its fine service and facilities. Cruising along the river and in the late afternoon stop in a typical river village. After dinner onboard our ship, enjoy a Dance and Drama performance by the Mandalay Arts School on the sundeck. Enjoy the sunrise. After an early breakfast, the passengers will disembark at Sagaing Jetty (Thursday only) or Gawein jetty (Sunday Only) at around 09.30/10.00 hrs. This afternoon visit the second most sacred image in Myanmar next to the Shwedagon Pagoda is the Mahamuni Pagoda. Next visit Golden palace Monastery famous for its intricate woodcarvings. Continue to the Kuthodaw Pagoda, which is known as the world largest book due to the Buddhist scripture carved on 729 marble slabs. Before sunset visit a 200-year-old teak bridge, the most photographic site in Myanmar. After breakfast drive (80 km – 2 hours) on a scenic route to Pyin Oo Lwin (Maymyo), principal hill station and summer retreat during the British colonial period, with its lovely lake, waterfalls, botanical garden and colonial era-buildings. Sightseeing in Pyin Oo Lwin starts with a visit to downtown colonial-era buildings and the central market. Unique, brightly painted miniature stagecoaches, drawn by lively teams of horses, are waiting to carry travelers to the National Kandawgyi Gardens, the beautiful botanical gardens of Maymyo. The cooler weather allows many flowers and fruits, commonly found in temperate climates, to thrive here. After lunch proceed to Peik Chin Myaung Cave, since ancient times a Buddhist shrine. Stop at a winemaking workshop before returning by road to Mandalay. Transfer to Airport for afternoon flight to Heho, gateway to Inle Lake and the Shan State. Known as the most beautiful lake in Myanmar, Inle Lake’s calm waters are surrounded by high hills and dotted with floating gardens and stilted villages. Upon arrival proceed to by road to Pindaya and visit Pinday Caves, a unique site housing thousand of Buddha images places there by pilgrims and devotes over the centuries. A scenic drive takes us to Nyaung Shwe, a small jetty where you pick up the private boat for a 30-minute ride to the hotel, located on the shores of the lake. This morning will be spent exploring beautiful Inle Lake. Continue sightseeing in Inle Lake, maneuvering by boat though long, scenic channnels where you can watch the farmers cultivate their produce in “floating gardens”. You will visit the fascinating village of Indein, with it’s complex of ancient shrines and stupas and walk though exotic colonnades of stairways and shop stalls. You’ll visit the “long neck” tribal women, and weaving and craft villages perched on stilts. See the lake’s unique “leg rowers” – the Intha people row standing up with one leg wrapped around an oar. Intersperse in the tour are various religious sites such as the St Mary’s Cathedral, built in 1899, and the Buddhist landmarks of Sule Paya and over 100 year old beautiful Rangoon Synagogue. In there you will have the opportunity to meet with Trustee of the Synagogue to learn the Jewish Life in the Pagoda Land. Then visit Little India and Chinatown – stop to greet the vendors and let them introduce you to their wares – some familiar, some exotic.